If you travel a VPN should be high on your list of tech services. A VPN will add a layer of security when you access online accounts from public wifi and guard your sensitive information from prying eyes. A VPN also allows you to stay connected to your favorite content and TV from back home. We'll explain how to use a VPN and which to choose. Whether you’re traveling abroad for work or pleasure, it’s often essential to be able to access the same platforms that you use at home, including banking and financial services, communication apps (such as WhatsApp and Skype), and streaming services. For example, you may be looking to stream content from sites like Netflix, Hulu, BBC iPlayer, or Sling TV, but these companies restrict their services based on your location. Plus you have issues with governments blocking access to sites like Google, Twitter, Facebook, and YouTube. The best way to access these and other geo-restricted platforms is to opt for a Virtual Private Network (VPN). Using a VPN while traveling will help in masking your specific geographical location and making it appear that you’re somewhere else, tricking websites into allowing you access. A VPN sets up an also encrypts your internet connection, preventing monitoring by Internet service providers (ISPs), hackers, and government agencies. This is especially important while traveling as you’ll likely expose your device to public wifi networks which are prime spots for hackers to lie in wait. Download the VPN apps on your smartphone, laptop, and tablet. Make sure you do so directly from the relevant app store or directly from the VPN provider’s site. Repeat the process for all your devices. Open the app and follow the instructions that the company relays on your screen. After installation is complete, restart all devices. When back online, open the VPN app and connect to a server in a location of your choice. The app will run in the background but be careful not to disconnect it. Congrats! Now you can use the internet just like you did back home. Note: Wifi networks and internet speeds are dependent on the country’s overall connectivity to the web. Using a VPN won’t amplify speed or give you blazing access like you’re used to back home, and the encryption factor will mean that your speeds may diminish to some extent. If you’re traveling to countries with poor internet access such as those in the Horn of Africa, then be mindful that a VPN can only do as much as the internet connection that feeds it. How do I decide on a suitable VPN service? VPN services are heavily prevalent all over the internet. Some users may fall in the trap of assuming they’re all the same. The reality, however, is that VPN services vary greatly — you definitely need to be prudent and exercise caution before deciding on one that works for your needs. Some VPN services offer thousands of servers, while others restrict their selection to about a hundred. There’s no hard and fast rule on which one’s better, but something to consider is where the servers are located. You don’t want a high concentration in a specific area while the rest of the world is ignored. VPNs are used to stay in touch with content from back home as well as unlock social media sites where they might be restricted. Hence you should evaluate server options in major countries and the regions where you want to access it. For example, if you’re an Aussie traveling abroad then you should look at the availability of servers in Australia in order to keep abreast of content from back home. When you travel in a group such as with friends and family, you may want to invest in a VPN plan that allows you to share the service with your travel mates. This way you can whittle the cost per person to less than a dollar a month. Before deciding on a suitable provider, you’ll want to check that the service is compatible with your preferred platforms. If you’re a PC and Android user, then you definitely want the VPN service to work on both. Not all VPN companies offer apps for the platform you’re looking for. For example, only a handful of VPNs have a Fire Stick app and even fewer VPNs have a Linux GUI. If you’re unsure on whether a provider is compatible with your device then it’s a good idea to check with customer support before purchasing a plan. VPN services incorporate sophisticated engineering but that doesn’t mean they should be clunky to setup and install. The best services make it extremely easy for users to register, install, and navigate through the options. You should be able to just download the native software, log in, and let the app do the rest with the click of a few buttons. Anything more taxing than that points to a clunky user experience which you should avoid. What other security protocols should I follow while traveling? Choose a strong password and enable 2-factor authentication wherever possible. Some Android phones have a setting where the device can be unlocked if it detects it’s in close vicinity of the user. Turn this setting off, because a thief could pilfer your phone and access its contents immediately. Update all your device software before leaving your home country so all security patches are fully functional and you’re protected as much as possible. Back up your phone every day so that important information, such as photos or work documents, are safely uploaded to the cloud and will always remain accessible, even if you lose your device. What are the best VPNs for traveling abroad? ExpressVPN is considered by most experts as one of the fastest, hardiest VPN providers out there. It’s at the top of our list as the best VPN for traveling abroad because it can unblock a bunch of streaming services (including US Netflix) and comes with military-grade encryption protocols to boot. The service is a bit pricey as compared to other providers, but you definitely get what you pay for. This is particularly relevant if you’re traveling to repressive states like China, Indonesia, and Iran, where many sites are regularly blocked. The superior cloaking abilities of ExpressVPN will ensure that you stay a step ahead of the authorities and enjoy an unencumbered internet experience. ExpressVPN uses 256-bit AES encryption; that’s considered to be an industry-leading standard, also referred to as ‘military-grade.’ Included is a built-in internet kill switch as well as DNS leak protection, so your information always remains locked within the encrypted tunnel. This provider follows a policy of not storing any detailed user logs, including IP addresses. ExpressVPN offers modern, intuitive apps for Android and iOS, as well as sleek desktop versions for both Windows and MacOS. A single subscription allows for three simultaneous connections. BEST FOR TRAVEL:ExpressVPN is our top choice due to its robust, fast speeds as well as superior customer service. NordVPN is tried and tested when it comes to evading government restrictions on internet access, as well as being able to unblock geo-restricted streaming services. It works really well in China which is a bonus for those traveling there regularly. This provider doesn’t store any user data and can be considered a completely logless provider. At the same time, NordVPN has rigorous security standards which include 256-bit encryption, the OpenVPN protocol, an internet kill switch, and DNS leak protection. Using this service, you’ll easily be able to circumvent restrictions for US Netflix, HBO, Amazon Prime Video, ESPN, and more. The product is highly customizable and enables users to select a server that optimizes certain tasks, which include streaming HD video, double VPN, and Tor over VPN. The website has a knowledge section which will take you through the process in case you are stuck. BEST BUDGET OPTION:NordVPN offers lots of customizable features at a price you can’t beat. IPVanish is another excellent choice for folks looking to benefit from fast speeds and ultra-secure privacy. These are both crucial factors when evaluating a VPN to use abroad, especially if you intend to stream video or access services like Skype, Google, WhatsApp, and your local bank account. The company chooses to operate its entire network of servers independently, as opposed to other providers that either rent space in server farms, or outsource management to a third party. This means it’s in total control of user traffic. IPVanish is a known favorite with torrenters and Kodi users because it enables them to download the Android APK directly to their device. The interface is remote control-friendly for Kodi devices that lack a keyboard and mouse. It also manages to unblock streaming sites such as BBC iPlayer and ITV Hub. This provider uses a system known as dynamic IP; when you connect to the service, you are assigned a new IP address for the entire duration of your session. That is yours alone and will not be assigned to another user. It’s only after you disconnect that the address goes back into the pool and will be used by another individual. IPVanish offers 256-bit encryption, perfect forward secrecy, DNS leak protection, and an internet kill switch. This means your IP address will remain hidden from prying eyes. Apps are available for Android, iOS, Windows, and MacOS. This provider recently upgraded its packages to allow 10 devices to connect at the same time, making it a far more generous allocation than the industry standard of five. What’s more, it offers 24/7 live chat for customer support. TORRENTING & STREAMING VPN:IPVanish is ultra-secure, quick, and a favorite with streamers and torrenters. It adheres to a no-logs policy and comes with all the bells and whistles of a modern VPN. CyberGhost is registered in Romania and does not have to comply with any data retention laws. It has considerably enhanced its core product since it was acquired by Crossrider in 2017 and now has a large focus on streaming. The number of servers it hosts has risen sharply from just a few dozens to almost 3,000. They’re housed in 59 countries overall. The company uses 256-bit encryption, perfect forward secrecy, an internet kill switch, and DNS leak protection as default. Privacy is further strengthened with an internal policy of not logging any IP addresses. Additional security features include an ad blocker, anti-malware defense, an anti-tracker, and an “immunizer” against ransomware attacks. CyberGhost can help you pick a server to unblock a specific streaming service, including US Netflix, BBC iPlayer, Amazon Prime Video, and more. Just select the “Unblock Streaming” mode within the app. You can access the service on Android, iOS, Windows, and MacOS. At the moment, a single subscription allows for seven devices to connect concurrently. IDEAL FOR NEWCOMERS:CyberGhost is fast, intuitive, and very easy for beginners to get started with. Its roster of services is also on the upswing. PrivateVPN offers great speeds on global connections and consistently unblocks streaming media sites. Not only will it unlock Netflix USA, but it’ll also do the same for Netflix in the UK, Canada, Japan, Spain, Brazil, Italy, and France. One of this provider’s strong points is its support options. Staff is available around the clock via live chat and can also remotely fix the problem for you if you grant them permission. The service is very secure as it uses 256-bit encryption, SHA256 authentication, and 2,048-bit RSA keys. There’s an internet kill switch as well as IPv6, DNS, and WebRTC leak protection. PrivateVPN has a policy of not storing any traffic logs. It’s so confident about its product that it offers a 30-day money-back guarantee on all packages. A basic plan will allow five devices to connect at the same time. Apps are included for iOS, Android, MacOS, and Windows. PERFECT FOR STREAMING:PrivateVPN unblocks a plethora of streaming sites. It focuses on quality as opposed to quantity in order to get the job done. VyprVPN has a valuable reputation around its ability to bypass censorship in repressive countries like China. As such, it’s a great choice for when you want the hardiest encryption protocols available. It uses 256-bit AES protocols paired with SHA256 authentication. For an additional fee, users can sign up for its proprietary Chameleon metadata scrambling technology that adds additional layers of security and thwarts even the most determined of government snoopers. This will hide the fact that you’re using a VPN in the first place. The one potential downside to this service is that it does maintain some logs. VyprVPN can unblock streaming services like US Netflix and Hulu. Plus, speeds were very fast when we tested it during our detailed user review, and it made the cut in our list of the fastest VPNs. Apps are available for Windows, MacOS, iOS, and Android. A single subscription allows for five devices to connect at the same time. GREAT ALL-ROUNDER:VyprVPN is one of the most sophisticated VPNs in the world and will definitely keep you secure as you travel. Read our review of VyprVPN. Should I use a free VPN when traveling abroad? The primary reason you want to use a VPN when abroad is to safely and securely access your favorite entertainment channels, use public wifi, or engage in financial transactions. The caveat here is that the method you use to obfuscate your location will deploy robust encryption protocols and deliver an excellent experience. The VPNs we’ve recommended in this article will definitely do that, but don’t hold your breath when it comes to the free options. Free VPNs don’t invest enough money in cloaking technology and aren’t interested in shipping the same product as paid services. You might be able to connect to a server but be prepared to be inundated with spammy advertisements and frequent interruptions in order to convince you to upgrade to a paid package. Free VPNs have lots of users and relatively few servers, which means servers are often overloaded. This makes free VPNs a poor fit for data-intensive tasks like streaming video, playing online games, or even accessing banking and financial services. Many unethical and unscrupulous providers have been caught illegally mining user data and selling it to third-party advertisers. Others have been known to infect host devices with malware and one has even gone a step further and leveraged idle bandwidth to build botnet armies. Streaming services like Netflix, Hulu, HBO, Sling TV, and others are bound by contracts to restrict their media content to IP addresses from specific countries. They will be liable to pay millions of dollars in penalties if they’re found shirking from this commitment. That’s the reason such entertainment giants spend an inordinate amount of money beefing up their security in order to detect and block VPNs. Free VPNs can be easily detected by their network administrators, but the sophisticated and advanced ones we’ve highlighted will do the job of protecting your location without breaking a sweat. How do I access WhatsApp and similar services where they are blocked? Your travels might take you to lands far and wide where internet freedoms and individual liberty aren’t guaranteed. As a result, you might see that commonplace services you take for granted, such as WhatsApp, Facebook, and Skype, are blocked. In some of these countries, the entire suite of WhatsApp features will be blocked while others might only stymie access to voice and video calls. Whatever the case, you certainly want to remain connected with loved ones from back home. In this situation, all you need to do is make sure there’s a VPN downloaded and installed on your device before you step on the plane. Doing so before you leave is important because VPNs are blocked in certain countries too. If you wait until arriving in the destination country, it’s possible that local ISPs might stop you from accessing the VPN website. Once you arrive, simply turn on the VPN app, connect to a server where you know WhatsApp works well (such as the US, Canada, or Europe), and only use the chat application once a connection has been successfully established. Note that VPNs themselves are blocked in some countries. We have separate guide on using a VPN in China and VPN use in UAE. 1 How do I set up a VPN? 2 How do I decide on a suitable VPN service? 3 What other security protocols should I follow while traveling? 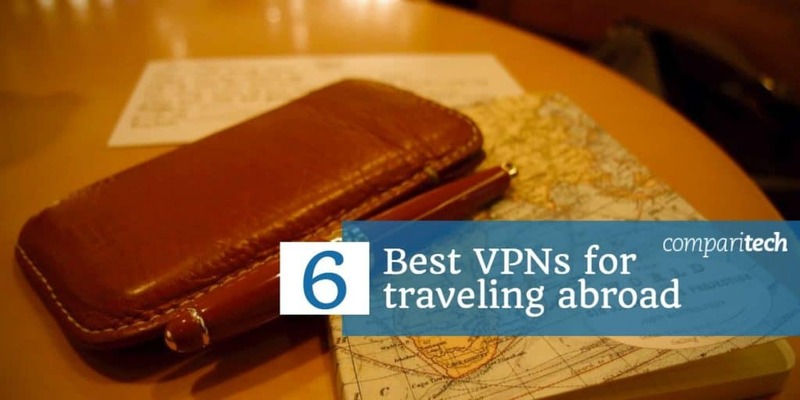 4 What are the best VPNs for traveling abroad? 11 Should I use a free VPN when traveling abroad? 12 How do I access WhatsApp and similar services where they are blocked?